Located just 15 minutes from downtown Anchorage, and 30 minutes from the Ted Stevens Anchorage International Airport, our private 975 sqft suite features gorgeous mountain views and takes up the whole bottom floor with a private entrance with electronic keypad for guests, and is located in an established Eagle River community. 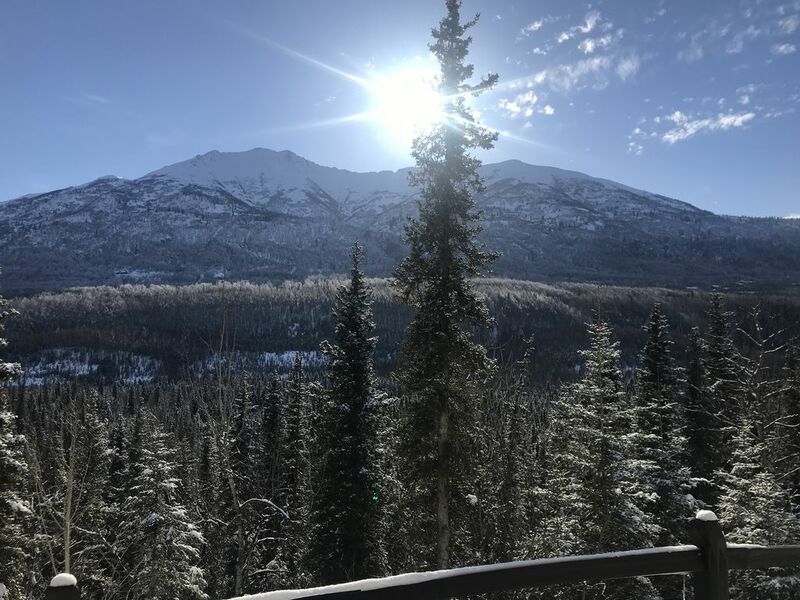 The unit offers a private covered porch with views of the Eagle River Valley, that leads to steps right down to hiking trails in the Chugach National forest. A perfect home base for exploring Alaska, whether you are looking for relaxation, or adventure. The space features one bedroom with a queen sized Tempurpedic bed, a living room with large sofa and 55" High Definition TV with DirectTV, and Bose Sound System (sofa can sleep guest if needed, or queen Aerobed available upon request), dining area, small kitchen, and bathroom with shower. Your stay comes equipped with free WiFi, fresh linens, towels, microwave, dishwasher, Keurig coffee maker and coffee pods, grill, and much more. If you have a little one, a pack and play and baby items are available upon request. Our property backs right up to the Chugach National Forest, and overlooks the beautiful Eagle River Valley. Allison and her family provided wonderful accommodations. The property is beautiful and so well maintained making us feel right at home during our stay. Great location just minutes from downtown. We explored a lot of the surrounding area as well as took day trips further out. The trail off of the back yard was definitely a plus! What a beautiful short hike down to the water. So much to see and do in Anchorage and this was the perfect home-base for it all! Thank you, Allison!! We were in Eagle River visiting family and stayed at this lovely gem. It is in a great location, not far from Anchorage or Wasilla. Perfect little place for me and my husband. We have a Tempurpedic bed at home, so were very happy that they have one! Made sleep so much better after long days checking out the Fur Rondy Festival and days seeing beautiful Alaska. Clean, neat, well-kept and private, the suite was just what we expected and a great stay! The fireplace made the suite cozy in the evenings, the sunrise views were breathtaking, and we couldn't have asked for a better place to stay for our 10th anniversary trip. Thanks so much for having such a wonderful place to stay! Perfect place for our stay! Lovely, clean, comfortable suite. Perfect for our stay near our son’s house! If I could give this home 10 stars, I would!!!! We are from the NC coast. We stayed at this beautiful home while visiting our daughter, her husband and their 3 kids. This was the perfect place for us to come home to after a busy day with family. Everything about this home is perfect!!!! Clean, roomy, beautiful view...comfortable bed...huge TV above the gas logs...spotless bathroom...private and decorated beautifully...yummy coffee each morning...quiet and cozy...and the owners always available if we needed something. We have now found the place we hope to call home for future visits!!! I'm sad to be leaving today!!!! This is a great little hideaway with an amazing view and ability to hike outside the door. We would definitely stay here again. Clean and nicely decorated with a great view. Perfect place to share some time with our son that is stationed in Alaska in the Coast Guard.